32 Champ Cres. Normanview. MLS#SK747024. Excellent approx. 1200 sq. 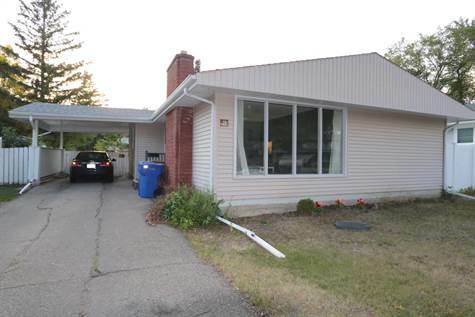 ft. 4 bedroom, 3 bathroom bungalow with a carport on a large lot and a quiet crescent. Kitchen features cappuccino colored cabinetry, b/I dishwasher/3 years old, fridge/stove (included), pantry, laminate flooring and large eating area. Spacious livingroom features large east facing wall of windows, laminate flooring & brick faced wood burning fireplace (white wall shelving will remain but the TV shelf & arm for TV will be removed). 3 bedrooms on the main floor all with laminate flooring (the curtains in the bedrooms will not remain) and master features a 2 pc ensuite. The 4 pc main bathroom completes the main level. The basement features a super large recroom, 4th bedroom, 3 pc bathroom and large laundry/storage room with washer/dryer included. (The basement requires carpeting. The sellers have never had water and were planning on putting in new carpeting but never did). The shingles were done approx. 2012, high efficient furnace, central air conditioning. The backyard has PVC fencing on 2 sides. Lots of room for a garage.